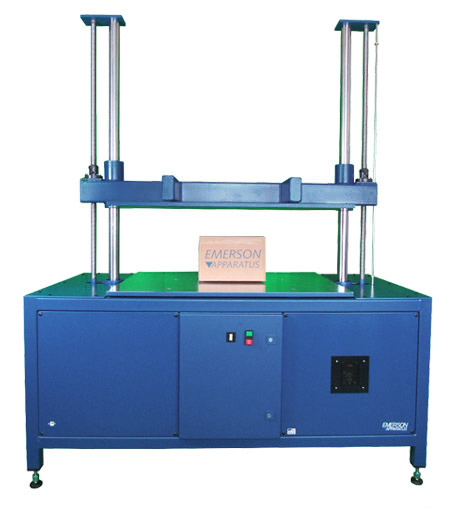 Give your testing equipment the “re-boot” it needs with these upgrades and retrofits from Emerson Apparatus. Included software runs on the Windows embedded Operating System and software and hardware enhancements present major improvements over the prior DOS and Windows versions. Brings your older machine to current technology with all new electronics and software. For Emerson Compression Tester Models 6200, 6210, 5200, 5210, 7200, 8510. Included software runs on the Windows embedded Operating System, and software and hardware enhancements present major improvements over the prior DOS and Windows versions. Set up customer box types with specific parameters for each test, review test results, and view single plots or superimpose multiple plots. ALL NEW ELECTRONICS—Specially configured and pre-loaded high-speed computer with color printer and 17-inch flat panel color display. 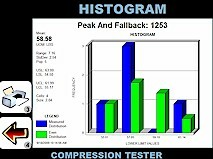 SOFTWARE ENHANCEMENTS—Upgrades existing features of older DOS and Windows versions of our Compression Tester Software, including “Test Explorer” for graphic data recall, automatic Software Stop Limits recall for the box you are testing, easier test value entry boxes, updated error handling, multiple chart overlays (to compare multiple test results on the same chart) . . . and much more! MICROSOFT WINDOWS OPERATING SYSTEM—Windows-based operating systems for reliability and fault tolerance. MICROSOFT ACCESS—New database model lets users add custom reporting, charting, and web connectivity outside the Compression Tester Software with purchase of Microsoft Access. Select up to 6 plots and overlay them all on one page, displaying information about each plot. ETHERNET—Industrial Ethernet, the new machine control standard, allows for high speed data transfer, no-loss communications, and inter-system compatibility. BOX LIMIT RECALL—Allows platen limit position recall when switching to predefined boxes. 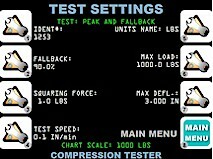 FULL SOFTWARE SUPPORT—Compression Tester Software versions 5.9 and up are fully supported by our programming staff. As features are added, upgrades will be available. PROGRAM RECOVERY—Users can recover their Compression Tester Software and calibration information in the event of a system failure. SIGNAL CONDITIONING—New digital signal processing algorithms present the cleanest, most noise free, real-time data from your compression tester to date. SPEED—CPU utilization is greatly reduced, yielding more robust system performance. ENHANCED TESTS—All tests have been updated, including a 10-point profile test that lets users set up to 10 distinct static loads, each with a specific duration, and run them concurrently. ENHANCED MONITORING—More system functions are monitored and controlled, such as “Motor Fault Conditions” resetting. RENEWED WARRANTY PERIOD—With a complete change of your electronics to newer, state-of-the-art systems, Emerson Apparatus warrantees the upgrade unit as it would a “new” tester. View statistical data for a variety of test results in the form of histograms. 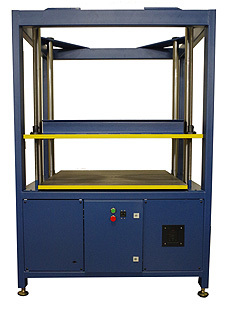 Contact Emerson’s sales team today about the “Compression Tester Electronics Upgrade/Retrofit” package. 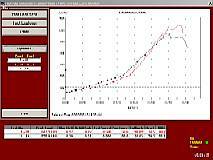 Choose tests pre-programmed with TAPPI specifications or set parameters for generic tests. Emerson’s new Electronics Enhancements/Upgrade Package for Models 1210 & 2210 provides all new Windows Operating System and hardware, adds accuracy and speed, is current with today’s technology, and provides storage for thousands of test results. PLUS you get additional reporting features, data logging capabilities, the ability to output files as .CSV and plot data points with MS EXCEL, various graphics and performance enhancements, increased dynamic response, and much more! Included software runs on the Windows Operating System and software and hardware enhancements present major improvements over the prior DOS and Windows versions. 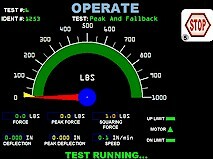 While running a test, monitor various forces and limits indicators. 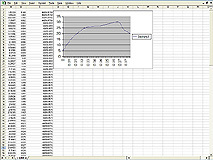 Download a “.CSV” file & use Microsoft EXCEL to plot data points. View test data in text form, bar form (pictured), and as line graphs. Contact Emerson’s sales team today about the “Electronics Enhancements/Upgrade Package for Models 1210 & 2210” package. With this MAJOR upgrade option, you’ll benefit from faster platen return speed, more precise speed control, and software enhancements to control speed and power without having to purchase an entirely new piece of equipment. Available for newer or previously upgraded Emerson Compression Tester Models 6200, 6210, 5200, 5210 or 7200. If you have an older Emerson Compression Tester Model, upgrade first with Emerson’s Compression Tester Upgrade and then add the “Enhanced Rapid Return Upgrade Option” package. Contact Emerson’s sales team today about the “Enhanced Rapid Return Upgrade” package.